Spursil™ polar-modified phases are based on ultra high-purity silica and novel polar modification technology. 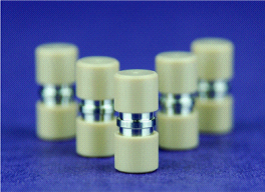 The unique bonded phases maximize polar retention and selectivity, while virtually eliminating silanol activity. The resulting polar-modified packing material contains a surface which is easily "wetted" with polar eluents and can run in highly aqueous conditions. The polar group also seems to play a role in base deactivation. 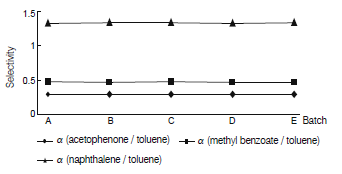 We have seen some evidence that hydrogen bonding occurs between certain polar linkers and the silica surface, thereby decreasing the interaction of such silanols with basic components in the sample. 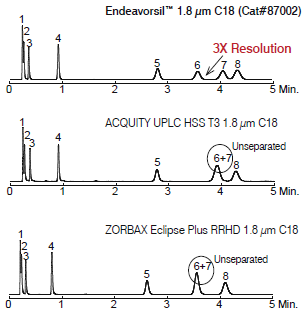 Additionally, polar-modified phases often provide selectivity quite different from standard C18 phases. 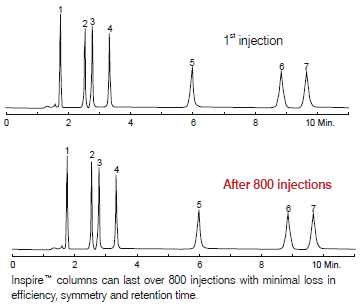 Standard reverse phase columns, particularly C18 columns, often suffer from "phase collapse" and the retention of the compounds is severely diminished when used in combination with highly aqueous phases. This phenomenon is substantially reduced with Spursil™ because the polar modifications make the phase less hydrophobic and more wettable. Polar-modified phases remain fully extended in aqueous phases, allowing increased interaction between samples and the bonded phase. 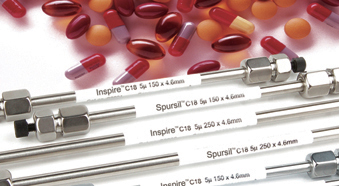 Spursil™ columns show good retention of polar compounds which tend to elute in the void volume on standard ODS phases. 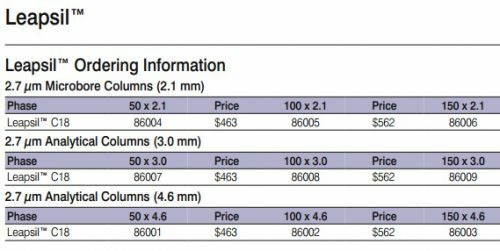 Spursil™ columns are available in 3, 5, and 10 micron particle sizes, column lengths are ranging from 30 mm to 250 mm, and column dimensions are ranging from 2 mm to 21.2 mm. 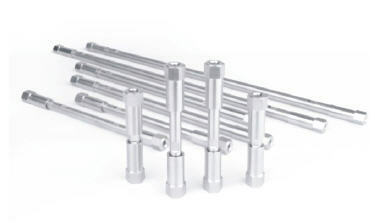 Ten micron preparative materials are available in bulk form. 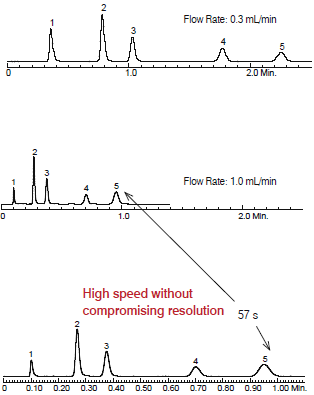 A chromatographic efficiency test is run on all columns. 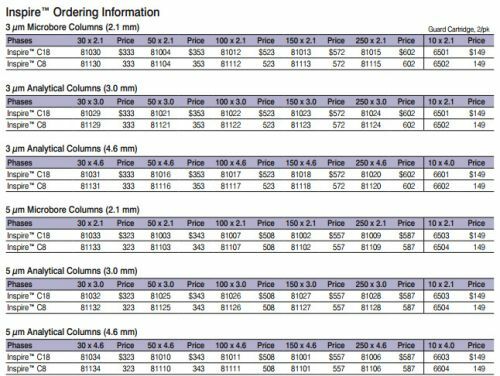 Plates per column and USP tailing factor are measured for each column to confirm packing efficiency. The USP tailing factor, a measure of peak symmetry at 5% of peak height, is a stringent indicator of peak shape. 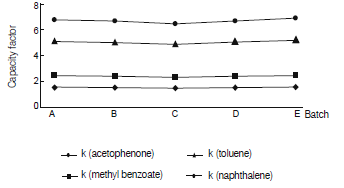 The test analytes are neutral hydrophobic compounds chromatographed in a acetonitrile: water mobile phase. 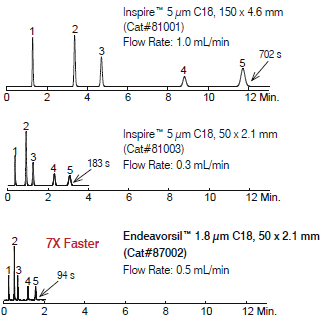 The retention, selectivity, efficiency and peak symmetry of these molecules are measured to provide specifications for column performance.